Love to binge-read clean and wholesome romance? 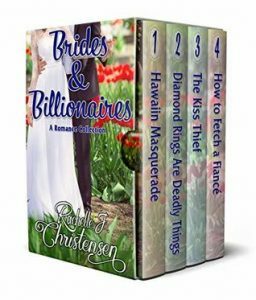 Indulge in this sampling of romance from award-winning author Rachelle J. Christensen. Billionaires, wedding planners, a librarian, and a record producer of Christian music are just a few of the characters you’ll meet in this collection. Enjoy 4 complete novels in one boxed set! Book 1: Hawaiian Masquerade: Could Lexi’s new billionaire status threaten her chance at love with a jaded, blue collar worker from Kauai? On the path to becoming a billionaire, Lexi Burke switches gears and flees the Chicago winters in favor of a slower pace of life along the beaches of Kauai. But when she meets a blue-collar worker and wannabe professional photographer named Derek Mitchell, any ideas for a slow pace disappear. Derek is incredibly hot and tempting, but he has a grudge against rich tourists, and wealthy people in general. Good thing he thinks Lexi is a regular person earning an average wage because the instant attraction is hard to ignore. Is Derek willing to see past the dollar signs to the woman underneath, or will he break both their hearts when he learns about the money behind the masquerade? Book 2: Diamond Rings Are Deadly Things: Adrielle Pyper knows how to plan a wedding, and she’s especially good at pleasing bridezillas. But when her biggest client and best friend is murdered just three days before the wedding, Adri’s world falls apart. She moves to the resort town of Sun Valley, Idaho, and starts from scratch. Thanks to Adri’s impeccable taste and unique style, she lands two celebrity clients, and her business seems headed for success—until someone vandalizes the specialty wedding dresses she imported from overseas. Adri must race to uncover the secret hidden within the yards of satin and lace before she becomes the next victim. Book 3: The Kiss Thief: As the head librarian of the Echo Ridge Library, Britta Klein thrives on order and categorization. Unfortunately, the old church-turned-library is in desperate need of a renovation. The Harvest Hurrah fundraiser seems to be the answer, but plans keep going awry. With help from Milo Geissler, accomplished musician, piano tuner, and kiss thief, each catastrophe is narrowly avoided. When Milo goes to great lengths to help Britta find a key classic book, she begins to wonder if there is more to life than books and order. Can she allow this man who speaks the language of music to tune her heart to a new song? Book 4: How to Fetch a Fiancé: Hurt and broken-hearted after a painful divorce, Audrey Blair picks up and moves to Nashville looking for a fresh start. I love these sets! It’s just fun to find a bunch of romances that you know you’re going to love. Rachelle Christensen is one of my very favorite authors. Let’s start with Hawaiian Masquerade. In the newest Destination Billionaire Romance, we find a bit of a twist on the plots. To this point the Billionaires have all been men, but in this book it’s the heroine, Lexi. She’s left her hectic life in Chicago working for her brother’s business to live a more quite life on the island of Kauai. She’s ready to get back in touch with her artistic side and spend time enjoying nature. She doesn’t count on finding love though. I loved the first chapter of this book, the way that Lexi cared for a small lost child in the craft store she was in says a lot about the kind of woman her character is. And, of course, she meets Derek as she’s trying to locate the young girl’s mother. Derek is a local photographer trying to scrape by on his earnings from selling his art. He resents having rich tourists come to the island, while at the same time needing them to buy his art. I love that in order to make ends meet, he helps his friend Pika sell coconut water to the tourists on the island. I love the way that Derek watches out for Pika’s mother, he’s always looking for ways to make her life a little easier. So sweet! This is a cute romance, I love the way that Lexi knows she needs to tell Derek about her money, but at the same time, just wants to be seen as a regular girl. And the way he finds out about her money is just a little crazy. I loved this book, I loved that it was short, sweet, cute and that I can let my daughter read it without worrying about it! Next up is Diamond Rings are Deadly Things. This is such a great book! I loved Adri, she’s such a well-written character. The reader is able to see things so clearly through her eyes. I really loved the setting, I grew up not too far from Sun Valley and was able to spend a little bit of time there during my high school years, this book brought those times vividly back to life for me. The tidbits at the beginning of the chapters from www.mashedpotatoesandcrafts.com, are so clever, kind of like the recipes in a culinary mystery. The plot kept me thinking, trying to figure out just who the bad guy was. I wouldn’t have guessed the ending, it took me by surprise. This is a suspenseful, romantic, clean book that I didn’t want to put down. I can’t wait for more of this great series! Then there’s The Kiss Thief. This one holds a special place in my heart because it’s set in the library and revolves around classic books. I loved Britta. Britta has worked her whole life to get rid of the stigma of being “The German Girl.” Even to the point of trying to get rid of everything about her that’s German. What she never understood was that she didn’t need to be “Un-German” to be special, she just needed to be her. And that’s what Milo is able to show her in this one. Milo is a German man in Echo Ridge that Britta has avoided ever since her mom insisted she date him. He’s had his own issues in his life and that causes a bit of trouble for the two later in the story. But he’s a good man. He’s always looking out for Britta and doing sweet little things for her. I loved this one as well! And last, but not least is How to Fetch a Fiance. This one was so great too! I loved the characters in it. The way I got sucked into the story from the very first page was one of my favorite things about it. I wanted to know just what would happen with Audrey and the man she hit in the head with the Frisbee. The way coincidence throws them together again after the Frisbee mishap was a lot of fun. Audrey’s life isn’t quite what she wants it to be at the beginning of the book. I loved her drive to make things happen and be the person she wants to be by the end of the book. And even change something she hadn’t even realized that she wanted to change. Then there’s Troy. He’s a great guy. He works hard, sometimes too hard. But he’s also always looking out for someone who needs him to help them. And he helps when he can. The romance in this one is sweet. And, of course, there are a few bumps on the road that need to be fixed by both Audrey and Troy. This whole collection is so much fun! I love books by this author because of the way she writes her characters, they seem so real. They almost seem as though they could step off the pages and live down the street from you. Make sure to grab this collection! I was sent an e-copy of Brides and Billionaires as a gift from the author. All opinions are my own.